Production: Robert Flaherty Productions, Inc. (Standard Oil of New Jersey); black and white, 35mm; running time: 77 minutes. Released September 1948, New York by Lopert Pictures, premiered at Edinburgh Film Festival, August 1948. Filmed in Louisiana bayou country. Cost: $258,000. Producers: Robert Flaherty with Richard Leacock and Helen Van Dongen; screenplay: Robert Flaherty and Frances Flaherty, from their original story; photography: Richard Leacock; editors: Helen Van Dongen, assisted by Ralph Rosenblum; sound: Benjamin Donniger; music: Virgil Thompson; music performed by: Philadelphia Orchestra under Eugene Ormandy. Cast: Joseph Boudreaux ( Boy ); Lionel Le Blanc ( Father ); Mrs. E. Bienvenu ( Mother ); Frank Hardy ( The driller ); C. T. Guedry ( His boilerman ). Award: Venice International Film Festival, International Award for "its lyrical beauty," 1948. Gromo, Mario, Robert Flaherty , Parma, 1952. Reisz, Karel, The Technique of Film Editing , New York, 1953; London, 1958. Clemente, Jose, Robert Flaherty , Madrid, 1963. Calder-Marshall, Arthur, The Innocent Eye: The Life of Robert Flaherty , London, 1963; New York, 1966. Klaue, Wolfgang, editor, Robert Flaherty , Berlin, 1964. Thomson, Virgil, Virgil Thomson , New York, 1966; London, 1967. Griffith, Richard, The World of Robert Flaherty , New York, 1970. Armes, Roy, Film and Reality: An Historical Survey , Baltimore, 1974. Murphy, William T., Robert Flaherty: A Guide to References and Resources , Boston, 1978. Rosenblum, Ralph, and Robert Karen, When the Shooting Stops . . . the Cutting Starts: A Film Editor's Story , New York, 1979. Barsam, Richard M., The Vision of Robert Flaherty: The Artist As Myth & Filmmaker , Bloomington, 1988. Orbanz, Eva, Filming Robert Flaherty's Louisiana Story: The Helen Van Dongen Diary , New York, 1998. Roullet, Serge, in Revue du Cinéma (Paris), April 1948. Variety (New York), 22 September 1948. New York Times , 29 September 1948. "Old Master," in Time (New York), 20 September 1948. Weinberg, Herman, in Sight and Sound (London), Autumn 1948. Life (New York), 4 October 1948. Losey, Mary, "More Seeing, Less Selling," in Saturday Review (New York), 9 October 1948. Hatch, Robert, in New Republic (New York), 11 October 1948. Carancini, Gaetano, in Bianco e Nero (Rome), April 1949. "How He Made the Louisiana Story in the Bayous of Louisiana," in Travel (New York), May 1949. Houston, Penelope, "Interview with Flaherty," in Sight and Sound (London), December 1949. Taylor, Robert Lewis, "Flaherty—Education for Wanderlust," in The Running Pianist , New York, 1950. Gray, Hugh, "Robert Flaherty and the Naturalist Documentary," in Hollywood Quarterly , Fall 1950. Van Dongen, Helen, "350 Cans of Film," in Cinema 51 , London, 1951. Flaherty, Robert, "Films: Language of the Eye," in Theatre Arts (New York), May 1951. Sammis, Edward, "Flaherty at Abbeville," in Sight and Sound (London), December 1951. George, George L., "The World of Robert Flaherty," in Film News (New York), no. 4, 1953. Manvell, Roger, in The Film and the Public , London, 1955. Flaherty, Frances, "Explorations," and "Robert Flaherty: The Man and the Filmmaker" by Charles Siepmann, in Film Book I: The Audience and the Filmmaker , edited by Robert Hughes, New York, 1959. Stanbrook, Alan, and Ralph Stephenson, in Films and Filming (London), December 1961. Weinberg, Gretchen, in Film Culture (New York), Summer 1966. Sadoul, Georges, "A Flaherty Mystery," in Cahiers due Cinema in English (New York), September 1967. Fondiller, Harvey, "Bob Flaherty Remembered," in Popular Photography (Boulder, Colorado), March 1970. Leacock, Richard, "Remembering Frances Flaherty," in Film Comment (New York), November-December 1972. Achtenberg, Ben, "Helen Van Dongen: An Interview," in Film Quarterly (Berkeley), Winter 1976. Holm, Sally V., in Magill's Survey of Cinema 3 , Englewood Cliffs, New Jersey, 1980. Leacock, R., "The Making of Louisiana Story ," in Southern Quarterly , vol. 23, no. 1, 1984. Starr, C., "Robert Flaherty's Louisiana Story ," in Southern Quarterly , vol. 23, no. 1, 1984. Short review, in Télérama (Paris), no. 2439, 9 October 1996. Robert Flaherty's last film is a fitting culmination to a long career. It is less a documentary about the Cajun people of Louisiana's bayou country, than an autobiographical film about Flaherty himself. From the viewpoint of a Cajun boy the film reveals the mysteries of the bayou wilderness, portrayed as an enchanting world of fantasy, filled with beauty and danger. The film is a poetic reflection of Flaherty's youth, in which he explores his own life-long relationship to the wilderness and natural environment, and to the people who live there. The opening sequence is one of the most celebrated in film history. Shots of alligators, magnificent birds, floating lily ponds, slithering snakes, and other wildlife and flora are given unity, continuity, and a sense of graceful movement. The brilliance of these sequences was the result of the troubled but highly successful collaboration between Flaherty and his talented editor, Helen Van Dongen. The outstanding night-time oil drilling sequence succeeds because of the interplay of images of the derricks accompanied by an atonal sound track. Flaherty's strength was in direction and shooting; Van Dongen's in her exceptional skill as an editor. The film's visual beauty is so effective that it overshadows the sponsor's message. 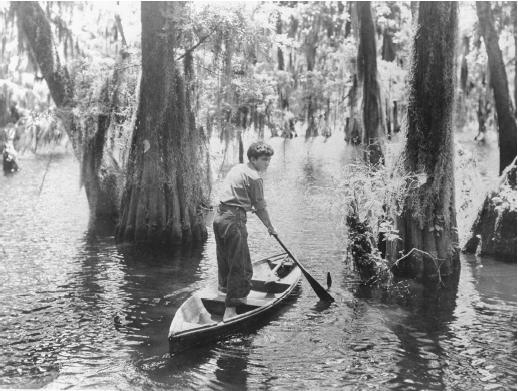 Oil drilling technology, first seen as an unknown threat to the tranquility of the bayou, in the end appears benign, leaving the impression that the unspoiled wilderness is safe. The simple visual beauty of this film pleased most of the contemporary critics, though he film's theme or message bewildered some. Many recognized that the scenes with speaking parts were not terribly convincing. As in other Flaherty films, the cast was chosen from the locals, more for their appearance than acting ability. Making them speak their roles showed the limitation of using real people in dialogue situations that must be rehearsed. They become stilted and artificial before the camera. Louisiana Story remains an enduring work of art for its sheer visual beauty, though some have argued its qualifications as a documentary, due to the manipulation of events depicted. Among films essentially based in reality, however, it remains one of the most successful collaborations of all time, with an impressive amalgamation of talent in direction, photography, editing, writing, and music.